One of the best things about traveling as a family is it deepens the bond between you and the most important people in your life. The problem-solving, adaptability, collaboration and creativity that comes with a family trip — particularly when you're traveling in an RV — can etch a memory of an epic family vacation in your mind for a lifetime. Blogger, designer and social influencer Amy Tangerine, set out with her family on a trip with this very goal in mind — to create a memory. For Tangerine, this trip was going to be different. She wanted to embark on an adventure as a family, get crafty with nature’s elements (her specialty) and eat really well. Therefore, she decided to take her husband JC and 5-year-old son Jack and head north up the coastline of California in an RV. Travel has myriad benefits, such as escaping from stress, gaining perspective and getting out of your comfort zone, but traveling by RV has even more health perks. You have room to pack and transport your favorite healthy foods, the freedom to frequently move your body, and you can relax your mind while enjoying a front-row view of the world passing by. Plus, going by RV can really amp up the adventure of your trip — there is spontaneity at the simple turn of the wheel. 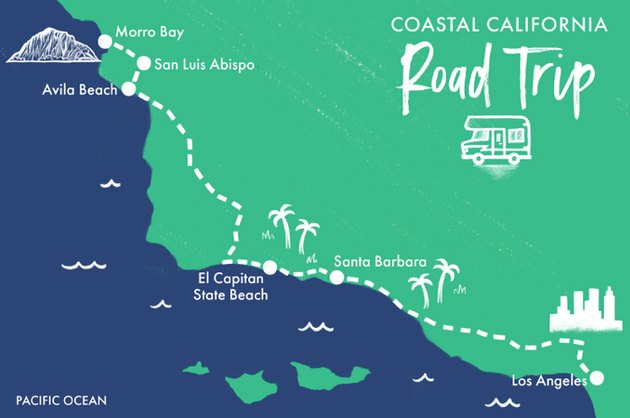 Tangerine and her family would be stopping off at Santa Barbara, San Luis Obispo and Morro Bay. The RV was packed with materials for art projects and chopped veggies for cooking (for this trip they would be skipping the restaurant waits). They had all the comforts of home, but on the road. After spending their first night on the beach at Ocean Mesa Campground in El Capitan, Santa Barbara, Tangerine decided to kick off a fun-filled day by eating a “home-cooked” breakfast. Breakfast tacos are nutritious, satisfying and casual yet curated (another one of Tangerine’s specialties). For an added bonus, her son Jack has the ability to pick and choose colorful toppings he loves and gets to eat with his hands. 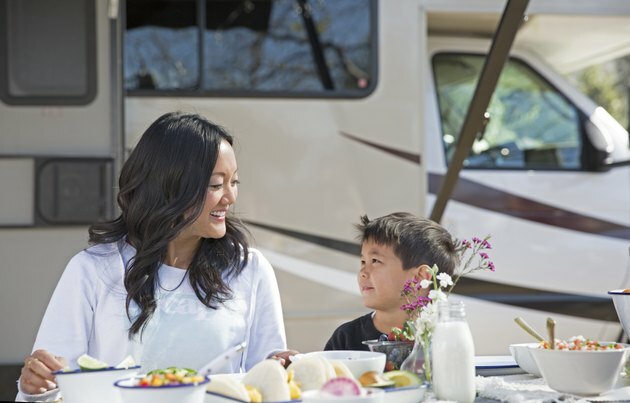 Considering the RV was equipped with a kitchen, plus having the ability to stop off at local organic markets, Tangerine had every reason to put her family favorite on the menu. After the family fueled up with significant protein and healthy carbs, they were brimming with energy for one of the best days of their trip — exploring new beaches and towns along the central coast. Tangerine’s fond family memory was well underway. Check out Tangerine and her family’s breakfast taco meal. Breakfast tacos are a colorful and eye-catching entree, which is why they are one of Tangerine’s go-tos. Anyone can make them because they are quick to cook and easy to assemble. Plus, you have a large selection of ingredients to chose from to really make them your own. 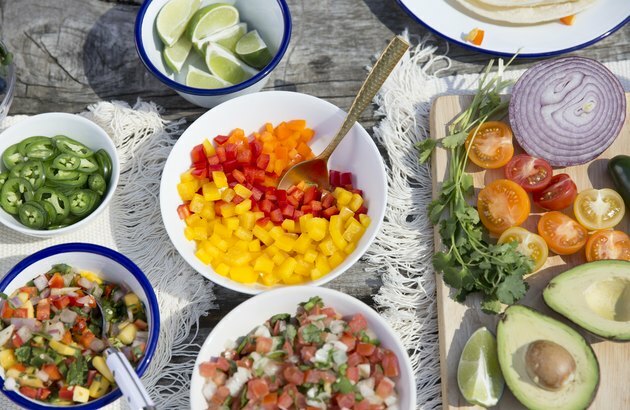 But to get you started below is a basic yet delicious recipe inspired by Tangerine’s breakfast tacos on her coastal family trip. There are some special ingredients, including vegetarian refried beans and cotija cheese. Cotija is a Hispanic-style cheese named after the city in Mexico. It is salty and crumbly (similar to feta) and can be bought at most markets or your local Mexican grocery store. 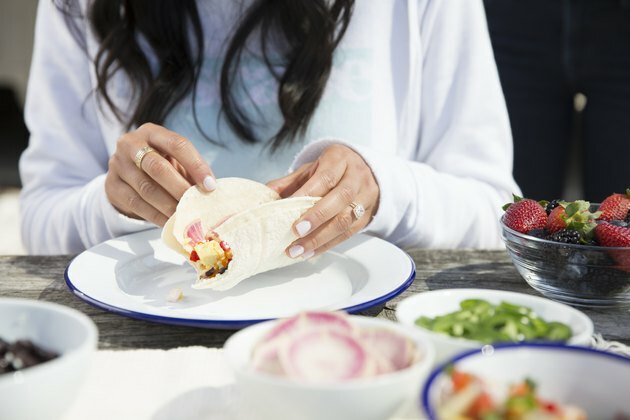 Start by warming or lightly grilling the corn tortillas (or whole-wheat tortillas). Spread the tortillas with the refried beans (warm first, if desired) and sprinkle with the cilantro. Set aside. Preheat the avocado oil (or peanut oil) in a large (12-inch or larger) stick-resistant skillet over medium-high heat. Fry or scramble the eggs until they are done to your liking. Top each tortilla with the eggs and avocado slices and sprinkle with the salt. Top with the pico de gallo (drained of excess liquid) and cotija (or feta) cheese. Serve with lime wedges.